This post is for my fellow Bloggers today - but if you would like to join as an individual - you are welcome to sign up! I am inviting fellow bloggers to join TreasureTrooper's exciting new "Blogger Exclusive" program. This is a new system they have created - especially with bloggers like you in mind. If you promote other search and win/ survey/tasks/videos/games / reward sites, I believe that this program would do very well with your audience. Let's talk about what they can do for you! 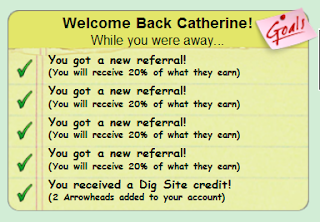 • $1.00 for every active referral you send them. • 7 cents for every Daily Survey your referrals take. • A $300 CASH BONUS when you reach 300 active referrals! • Monthly, blogger only, referral contests for cash and prizes. Now, while they realize that cash is a great motivator, they also recognize that our bloggers need to have the right tools in place in order to maximize the amount of signups they get. Here's what they will create just for you! • A $5.00 Signup Bonus just for your readers. Most new signups get just $1.00. • A customized referral URL of your choosing. I could go on and on about their features and offerings, but at this point I'd like to simply ask that you apply to be a part of this exciting new program. After you apply, they will follow-up with further instructions, your custom tools, and more tips for maximizing your earnings with them. Also, please don't hesitate to respond with any questions you might have. I am happy to help! Thanks for reading, and I hope to see you join up real soon! Check to see if there is an opt out or opt in check box. You don’t need to sign up for extra email. Uncheck that box unless you really do want more email from that company.